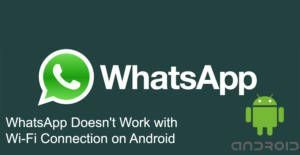 Sometimes WhatsApp does not work with Wi-Fi connections and many solutions don’t work for this problem for Android devices. Unfortunately there are still many users who are facing this problem from different countries of the world. Somehow while application is working with mobile data connection, Wi-Fi doesn’t even connect to the app. The reason of this problem is still unknown but this can be related with the IP you use and your internet connection, another reason can be servers of WhatsApp (but it’s very small possibility). We will recommend some solutions here. We are going to provide some solutions for you here to get rid of this error. WhatsApp Doesn’t Work with Wi-Fi! How to Fix? Do Not Reinstall Application Over and Over!! Which Connection Type is Best for Downloading WhatsApp Files? We have noticed that many users are trying to resolve this problem with reinstalling the application. They are spending much time with reinstalling WhatsApp several times. However it won’t help you at all. Please do not spend your time with reinstalling application since it is a connection/server based issue. There is nothing wrong with your device and application. If you have enabled proxy connection and if you forget to disable it, you will need to disable proxy connections. WhatsApp doesn’t support such connection types. We recommend you try another kind of service if you even connect to WhatsApp with that connection type. Close WhatsApp on your device and clear cache of the app. Wait for 2 minutes minimum. Then plug your router again. Turbo VPN – Unlimited Free VPN: It is a free VPN and got very good reviews from Android users on Google Play: 4.7/5. Hola Free VPN Proxy: It is also good free VPN service which you will able to connect with different countries IP. The application got also good reviews from Android users as same as Turbo VPN: 4.5/5. According to WhatsApp user reports, the problem will be fixed about 15-30 minutes. However we recommend you to contact WhatsApp regarding this problem. You can click here to learn how to contact. I am very new on WhatsApp. Actually I just downloaded the application about 4 minutes ago. It is not very popular in United States yet and I needed it for calling a friend from Europe. Well, I just need to know which connection I should use for downloading files of WhatsApp? Mobile Network can be expensive for me a little bit but not sure. Also I need a good connection for video calling and voice calling? Welcome to How to Chat Online and our Q&A service. Sometimes wifi connection does not work properly on the application. However Wifi is the best option for downloading files and people are generally preferring that option. You have already told the reason of that in your question content. Mobile Network connections are quite expensive in countries like UK and United States of America. So we recommend you to have files with Wifi. We also recommend you to use call and video call features with Wifi connection again.